Matthew David McConaughey (/məˈkɒnəheɪ/; born November 4, 1969) is an American actor. He first gained notice for his breakout role in the coming-of-age comedy Dazed and Confused (1993). He appeared in such films as the slasher Texas Chainsaw Massacre: The Next Generation (1994), the legal thriller A Time to Kill (1996), Steven Spielberg's historical drama Amistad (1997), the science fiction drama Contact (1997), the comedy EDtv (1999), and the war film U-571 (2000). In the 2000s, McConaughey became best known for starring in romantic comedies, including The Wedding Planner (2001), How to Lose a Guy in 10 Days (2003), Failure to Launch (2006), Fool's Gold (2008), and Ghosts of Girlfriends Past (2009). Since 2011 he has preferred dramatic roles, in such films as The Lincoln Lawyer (2011), Bernie (2011), Killer Joe (2011), The Paperboy (2012), Mud (2012), Magic Mike (2012), The Wolf of Wall Street (2013), Dallas Buyers Club (2013), Interstellar (2014) and Free State of Jones (2016). McConaughey achieved much success in 2013 for portraying a cowboy diagnosed with AIDS in the biographical film Dallas Buyers Club, which earned him both the Academy Award and Golden Globe Award for Best Actor, among other awards and nominations. In 2014, he also starred as Rust Cohle in the first season of HBO's crime anthology series True Detective, for which he won a Critics' Choice Award and was nominated for an Emmy Award. Matthew McConaughey, the youngest of three boys, was born on November 4, 1969 in Uvalde, Texas. His mother, Mary Kathleen "Kay" or "KMac" (née McCabe), is a former kindergarten teacher and a published author. She was originally from Trenton, New Jersey. His father, James Donald McConaughey, was from Louisiana and ran an oil pipe supply business. He played for the Kentucky Wildcats and the Houston Cougars college football teams. In 1953, Jim McConaughey was drafted in the 27th round by the NFL football team the Green Bay Packers. He was released before the season began and never played an official league game in the NFL. Matthew's mother and late father married each other three times (having divorced each other twice). His ancestry includes Scottish, English, Irish, Swedish and German. He is a relative of Confederate brigadier general Dandridge McRae. McConaughey had a Methodist upbringing. McConaughey moved to Longview, Texas in 1980, where he attended Longview High School. He lived for a year in Warnervale, New South Wales, Australia, as a Rotary exchange student in 1988. He attended the University of Texas at Austin, where he joined Delta Tau Delta fraternity. He began in the fall of 1989 and graduated in the spring of 1993 with a bachelor's degree in Radio-Television-Film. His original plan had changed as he wanted to attend Southern Methodist University until a brother told him that private school tuition would have been a burden on the family finances. He also had planned to attend law school after graduation from college, but he realized he was not interested in becoming a lawyer. McConaughey began working in television commercials, including one for the Austin, Texas daily newspaper, the Austin American-Statesman, which is credited as his first speaking role. The line, "How else am I gonna keep up with my 'Horns?" – a reference to his beloved Texas Longhorns sports teams – gave the local community a look at the young actor, before he was cast in Richard Linklater's film Dazed and Confused. In 1992, he was cast as "Joe" in Trisha Yearwood's video for her hit song "Walkaway Joe." 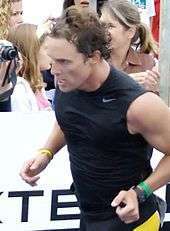 After some smaller roles in Angels in the Outfield, Texas Chainsaw Massacre: The Next Generation, Boys on the Side, the television series Unsolved Mysteries, and as the male lead in the Trisha Yearwood music video for the song Walkaway Joe, McConaughey's big break came as the lawyer Jake Brigance in the film A Time to Kill (1996), based on the John Grisham novel of the same name. In the late 1990s, McConaughey was cast in leading roles in more movies, including Contact, Amistad, The Newton Boys, EDtv and U-571. During the early start of McConaughey's career, he appeared in several movies, rated highly among his peers. By the early 2000s, he was frequently cast in romantic comedies, including The Wedding Planner and How to Lose a Guy in 10 Days, both of which were successful at the box office. During this period, he appeared as a firefighter in the low-budget film Tiptoes, with Kate Beckinsale, in Two for the Money as a protégé to Al Pacino's gambling mogul, and in Frailty, with Bill Paxton, who also directed. McConaughey starred in the 2005 feature film Sahara, along with Steve Zahn and Penélope Cruz. Prior to the release of the film, he promoted it by sailing down the Amazon River and trekking to Mali. That same year, McConaughey was named People magazine's "Sexiest Man Alive" for 2005. In 2006, he co-starred with Sarah Jessica Parker in the romantic comedy Failure to Launch and as Marshall head football coach Jack Lengyal in We Are Marshall. McConaughey also provided voice work in an ad campaign for the Peace Corps in late 2006. He replaced Owen Wilson in Ben Stiller's Tropic Thunder after Wilson's suicide attempt. On January 21, 2008, McConaughey became the new spokesman for the national radio campaign, "Beef: It's What's for Dinner", replacing Sam Elliot. McConaughey recognized that his "...lifestyle, living on the beach, running with my shirt off, doing romantic comedies" had caused him to be typecast for certain roles, and he sought dramatic work with other themes. I got to feeling like, for a few years, I was doing something that I liked to do with romantic and action comedies. But believe me, I noticed there were other things that were not coming in. And if they were coming in, it was in an independent form with a much smaller paycheck, and nobody really wanting to get behind them ... But I knew I could say no to the things I'd been doing. In saying no to those things, I knew work was going to dry up for awhile ... Year and a half, still nothing. At two years, all of a sudden, in my opinion, I became a new good idea for some good directors. In 2012, McConaughey starred alongside Channing Tatum in Magic Mike, based on Tatum's early life, which was directed by Steven Soderbergh. He returned to his East Texas roots, working again with director Richard Linklater on Bernie, playing district attorney Danny Buck Davidson. In June 2012, McConaughey was invited to join the Academy of Motion Picture Arts and Sciences. In 2013, he played Ron Woodroof in Dallas Buyers Club. The role of a rodeo rider who discovers he has AIDS and struggles to get treatment, required him to lose nearly 50 pounds (22 kilograms). The film gathered wide critical acclaim and earned McConaughey many acting awards, including the Screen Actors Guild Award for Outstanding Performance by a Male Actor in a Leading Role, the Golden Globe Award for Best Actor – Drama, and the coveted Academy Award for Best Actor. His co-star Jared Leto won the Academy Award for Best Supporting Actor, making Dallas Buyers Club the first film since Mystic River (2003) to win both awards. During this time, McConaughey recorded a public service announcement in Austin, Texas for the LBJ Presidential Library. In April 2014, Time magazine included McConaughey in its annual Time 100 as one of the "Most Influential People in the World." In August 2014, the Lincoln Motor Company signed a multi-year collaboration with McConaughey for an ad campaign. The commercials, directed by Nicolas Winding Refn (Drive), featured McConaughey as a storyteller driving around in Lincoln's MKC crossover. Shortly after the commercials debuted in September 2014, they were parodied by Ellen DeGeneres, Conan O'Brien, Jim Carrey, South Park, and Saturday Night Live. Overall sales for Lincoln increased by 25 percent one month after the ads debuted. The series of commercials starring McConaughey continued until October 2015; during this period he also endorsed the MKZ sedan and MKX crossover. He shared star billing with Woody Harrelson in HBO's 2014 series True Detective. For his role as Rustin Cohle, he won the Critics' Choice Television Award for Best Actor in a Drama Series. He was also nominated for the Primetime Emmy Award for Outstanding Lead Actor in a Drama Series, which he lost to Bryan Cranston and the Golden Globe Award for Best Actor – Miniseries or Television Film. With his first Oscar win and the critical acclaim received for True Detective, "McConaughey seems to be tapping into something essential, remaining himself while stretching, getting older while staying the same age." Critic Rachel Syme dubbed his recognition and performances while taking on more complex, dramatic roles as "The McConaissance." McConaughey also played Cooper, a widowed father and astronaut, alongside Anne Hathaway, Jessica Chastain, Michael Caine, Mackenzie Foy, and Casey Affleck in Christopher Nolan's science fiction film Interstellar (2014). After finishing Gus van Sant's 2015 film The Sea of Trees with Ken Watanabe, McConaughey starred in two films for 2016 release: Gold and The Free State of Jones. He also voiced parts in two animated films, Kubo and the Two Strings and the upcoming Sing. In 2016, McConaughey was hired as creative director and celebrity spokesman for Wild Turkey's latest campaign, to bring in more women and more international customers. McConaughey met Brazilian model and television performer Camila Alves in 2006. The couple became engaged on December 25, 2011, and were married on June 9, 2012, in Austin, Texas (where they reside) in a private Catholic ceremony. Together they have three children: sons Levi Alves McConaughey (born July 7, 2008), Livingston Alves McConaughey (born December 28, 2012), and daughter Vida Alves McConaughey (born January 3, 2010). He is a Christian and attends a non-denominational church. McConaughey started the just keep livin foundation, which is "dedicated to helping teenage kids lead active lives and make healthy choices to become great men and women". On February 25, 2016, McConaughey received the Creative Conscience award from unite4:humanity for his work with his just keep livin foundation. He rescued various pets stranded after the flooding of New Orleans from Hurricane Katrina. In 2006, he rescued a cat from two youths in Sherman Oaks, California before they could set it on fire. McConaughey's older brother Mike, nicknamed "Rooster", is a self-made millionaire who stars in the CNBC series West Texas Investors Club. McConaughey is teaching classes at the University of Texas, the first session of which was about the filming of the 2016 film Free State of Jones. For the second session, he will team with Hunger Games director Gary Ross and university lecturer Scott Rice. The college course, part of Moody College of Communications, will be open to juniors and seniors. There are no prerequisites or fees to take the once a week course. McConaughey frequently returns to his alma mater to see Longhorns football games. ↑ "Celebrity Faith Database". Belief.net. Retrieved 2015-01-02. ↑ "NLS/BPH: Other Writings, Say How? Key to Pronunciation". Loc.gov. 2013-01-07. Retrieved 2014-03-07. 1 2 3 4 "Matthew McConaughey". Biography.com. Retrieved August 19, 2014. ↑ "Matthew McConaughey: from himbo to highbrow". The Guardian. 28 June 2012. Retrieved 26 April 2013. 1 2 3 4 5 Cohen, Jason (August 1996). "His Time to Kill". Texas Monthly. Retrieved October 28, 2014. 1 2 Julie Tereshchuk (2012-04-26). "All in the Family". Austin Woman Magazine. Archived from the original on 2012-05-04. ↑ "Matthew David Mcconaughey". familysearch.org. Retrieved March 4, 2015. ↑ Story, Mark (February 24, 2014). "Mark Story: Matthew McConaughey's dad played college football for ... Kentucky?". kentucky.com. Retrieved October 28, 2014. ↑ "1953 Green Bay Packers". databasefootball.com. Retrieved May 24, 2013. ↑ "The 1953 Green Bay Packers". Retrieved May 24, 2013. ↑ "Matthew McConaughey Biography (1969–)". Filmreference.com. Retrieved October 16, 2009. ↑ Duffy, Ty (March 10, 2014). "Matthew McConaughey's Dad Was Drafted by the Green Bay Packers in 1953". USA Today. Retrieved October 28, 2014. ↑ Tom Shone (March 3, 2014). "Matthew McConaughey: exclusive interview". The Daily Telegraph. Retrieved September 26, 2014. ↑ "Barbara Walters' Oscar Special". ABC7news.com. Retrieved April 15, 2006. ↑ "Biography for Matthew McConaughey". imdb. Retrieved 17 October 2013. ↑ "60 Second interview: Matthew McConaughey". Metro. Retrieved May 7, 2006. ↑ Dunham, Chris (July 14, 2009). "Mr. McConaughey's Marriage Problem". genealogywise.com. Retrieved May 24, 2013. ↑ "Matthew David McConaughey". Genealogy.kathihill.com. Retrieved May 24, 2013. ↑ "No use putting out the welcome Matt". The New Zealand Herald. May 12, 2001. Retrieved August 5, 2010. ↑ "Wedding Planner, The : Interview With Matthew McConaughey". Google. Archived from the original on July 24, 2008. Retrieved August 5, 2010. ↑ "Find Articles". Matthew's interview – Matthew McConaughey – Interview. Retrieved April 15, 2006. ↑ "ONE news". McConaughey credits Australian town. Retrieved December 22, 2006. ↑ "The Castilian Dorm Serving the University of Texas Receives Upgrades (PR.com)". Student Housing Planet. March 26, 2009. Retrieved October 16, 2009. ↑ "Dazed and Confused Movie Reviews, Pictures". Rotten Tomatoes. Retrieved August 5, 2010. ↑ "Matthew McConaughey's First Break? A 1992 Trisha Yearwood Video". people.com. March 6, 2014. Retrieved October 2, 2015. ↑ "Watch the moment Matthew McConaughey proved he was Oscar-worthy". Entertainment Weekly. March 3, 2014. Retrieved October 2, 2015. ↑ "Matthew McConaughey: exclusive interview". The Daily Telegraph. Retrieved August 23, 2014. ↑ "Two for the Money Film Locations - On the set of New York.com". onthesetofnewyork.com. Retrieved 2015-08-13. ↑ "On a Desert Gallop, Planting Assorted Red Flags". The New York Times. April 8, 2005. Retrieved August 27, 2014. ↑ "McConaughey's elusive quest". cnn.com. April 14, 2005. Retrieved August 27, 2014. ↑ "2005 Sexiest Man of the Year". People. Retrieved May 19, 2008. ↑ Maugh, Casey Malone. Peace Corps in the 21st Century: A Rhetorical Analysis. p. 41. ↑ "Matthew McConaughey to Replace Owen Wilson in Film". PEOPLE.com. ↑ ""Beef. It's What's For Dinner" Advertising Campaign Invites Consumers to Discover the Power of Protein" (Press release). National Cattlemen's Beef Association. January 7, 2008. Retrieved July 2, 2008. ↑ Shinn, Peter (January 8, 2008). "Iowa beef producers talk ethanol, checkoff, ID and more". Learfield Communications, Inc. Retrieved July 2, 2008. 1 2 Fleming, Mike Jr. (2014-06-04). "EMMYS Q&A: Matthew McConaughey on Following Oscar with the Game-Changing HBO Series ' Detective'". Deadline Hollywood. Retrieved 4 June 2014. ↑ "The Body Politic: Review: 'Magic Mike,' by Steven Soderbergh, With Channing Tatum". The New York Times. June 28, 2012. Retrieved August 23, 2014. ↑ "Bernie Tiede released from prison, will live with 'Bernie' director Richard Linklater". The Washington Post. May 7, 2014. Retrieved August 23, 2014. ↑ Thompson, Arienne (June 29, 2012). "McConaughey, Spencer invited to join Academy". USA Today. Retrieved July 19, 2013. ↑ Ellwood, Gregory (November 14, 2012). "Matthew McConaughey reveals how he lost and ponders a 'Magic Mike' sequel". HitFix. Retrieved April 16, 2013. ↑ "Dallas Buyers Club (2013)". Rotten Tomatoes. Flixster. Retrieved January 7, 2014. ↑ "Dallas Buyers Club Reviews". Metacritic. CBS Interactive. Retrieved November 16, 2013. ↑ Harris, Aisha (November 1, 2013). "How Accurate Is Dallas Buyers Club?". Slate.com. Retrieved December 18, 2013. ↑ Salamon, Jeff. "Matthew McConaughey Has A Presidents' Day Gift For You". Texas Monthly. Retrieved 18 February 2013. ↑ Linklater, Richard (April 23, 2014). "Matthew McConaughey: The most surprising actor in Hollywood". Time magazine. Retrieved May 7, 2014. ↑ "Lincoln Motor Company and Matthew McConaughey Begin New Creative Journey". August 21, 2014. ↑ Walker, Michael (December 29, 2014). "New Matthew McConaughey Ads for Lincoln to Debut New Year's Day (Video)". ↑ Andreeva, Nellie (April 30, 2012). "HBO Picks Up Matthew-Woody Series 'True Detective' With Eight-Episode Order". Deadline Hollywood. Retrieved June 26, 2012. ↑ "Matthew McConaughey Wins Critics Choice Awards 2014 Best Actor". Youtube. Retrieved March 4, 2015. ↑ "Emmys: Why did 'True Detective,' Matthew McConaughey get shut out?.". ↑ Mitovich, Matt Webb (December 11, 2014). "Golden Globes: Fargo, True Detective Lead Nominations; Jane the Virgin, Transparent Score Multiple Nods". TVLine. Retrieved December 11, 2014. ↑ Rachel, Syme. "The McConaissance". The New Yorker. Retrieved 2014-02-19. ↑ Goldberg, Matt (April 3, 2013). "Matthew McConaughey Confirmed to Lead Christopher Nolan's INTERSTELLAR". collider.com. Retrieved April 3, 2013. ↑ Kit, Boris. "Matthew McConaughey to Star in Gus Van Sant's 'Sea of Trees'". The Hollywood Reporter. TheHollywoodReporter.com. Retrieved March 18, 2014. ↑ McMahan, Dana. "In Nod to Female Bourbon Fans, Wild Turkey Hires Matthew McConaughey". Retrieved 9 August 2016. ↑ "Wild Turkey Bourbon: Matthew McConaughey Short Film". YouTube. WildTurkey. Retrieved 9 August 2016. ↑ "Matthew McConaughey and Camila Alves: Inside Their Relationship". people.com. December 27, 2011. Retrieved October 2, 2015. ↑ "Matthew McConaughey, Camila Alves Wedding". People. June 9, 2012. Retrieved June 10, 2012. ↑ Bromley, Melanie; Malkin, Marc (June 8, 2012). "Matthew McConaughey and Camila Alves Getting Married in Top-Secret Texas Wedding—This Weekend!". E!. ↑ "Matthew McConaughey and Camila Alves welcome son Levi". People. July 8, 2008. Retrieved April 14, 2012. 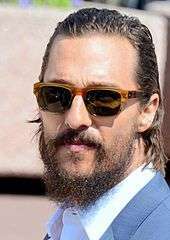 ↑ "Matthew and Camila McConaughey Welcome Son Livingston". People. December 28, 2012. Retrieved December 30, 2012. ↑ "Matthew McConaughey, Camila Alves Welcome daughter, Vida". People. January 3, 2010. Retrieved 30 January 2012. ↑ "Is Hollywood Getting Saved? Matthew McConaughey, Gwen Stefani, & More Reveal Relationships With God [VIDEOS]". BREATHEcast. 2014-11-06. Retrieved 2015-10-17. ↑ "j.k. livin". Matthew McConaughey. Retrieved August 5, 2010. ↑ Saval, Malina (2016-02-26). "Matthew McConaughey, Morgan Freeman, Others Honored at Variety's Unite4:Humanity Benefit". Variety. Variety Media, LLC. Retrieved 2016-05-20. ↑ Toronto Fashion Monitor: "Matthew McConaughey Saves the Pets.". Retrieved March 25, 2007. ↑ San Francisco Chronicle: "McConaughey in Cat Rescue", Retrieved March 25, 2007. ↑ Winfrey, Graham (11 August 2015). "Meet the Self-Made Millionaires of 'West Texas Investors Club'". Inc.com. Retrieved 13 August 2015. 1 2 3 4 French, Megan (July 1, 2016). "Matthew McConaughey will return to his alma mater to teach behind the scenes course". Us Weekly. Retrieved 1 July 2016. Wikimedia Commons has media related to Matthew McConaughey.